There are too many access questions for us to post everything on here but if you have a question then please contact us. Send us an email at help@accessolutionllc.com and we’ll publish your questions (anonymously) with our answer. How does the ADA affect my business? But doesn’t a contract mean that I am exempt? I am not a tenant or a landlord, why should I be concerned? Aren’t I safe because of a grandfather clause? Why should I get an ADA inspection? What is the best thing for me? Why can’t I ask any architect or contractor to check for my ADA compliance? Why can’t I ask my attorney to check my ADA compliance? Won’t an ADA inspection just make me more liable? Are there any simple and easy things to do for accessibility? How can I stop from getting sued? You probably have some questions about how and if accessibility applies to you. The Americans with Disabilities Act was signed into law in 1990. Title III of the ADA requires that all places of public accommodation be made accessible. There is no ‘grandfather clause’ that protects buildings built before 1990- not even for historic landmarks. Building code can be ‘grandfathered’. The ADA is different from building code. The ADA is civil rights legislation and cannot be ‘grandfathered’. Non-compliance with the ADA under California law IS an act of discrimination. And you can never ‘grandfather’ discrimination. If your business is open to the public, it must be ‘accessible’ in accordance with federal and state guidelines. We have looked at literally thousands of businesses. We have never seen one which is 100% compliant. Getting your site surveyed won’t protect you from liability. Only compliance can provide protection. Surveying your site is the first step towards compliance. For your education, the group Lawyers Against Lawsuit Abuse has provided this technical document to address this question. You can read it here: Who is Liable for ADA Violations? Landlord and tenant disputes have been happening since the concept of rent was invented. But accessibility law is broadly written. Accessibility is everyone’s responsibility. Landlords often try to pass costs onto tenants (‘Triple-Net’) while tenants claim that the costs are the landlord’s responsibility. But unless the lease agreement explicitly states that the tenant is responsible for ADA compliance (and not simply ‘compliance with local, state and federal laws’), courts will usually side with the tenant in the event of an ambiguity. Furthermore, tenants often require permission from the landlord to perform renovations in the first place, and if the tenant moves out, the landlord gets to enjoy those renovations permanently. This doesn’t mean a tenant is safe, however. Even though accessibility requirements can be obscure, both tenant and landlord remain liable since accessibility 1) is easily visible to the naked eye, 2) a tenant agrees to the condition of the property before leasing and 3) both parties have some control over the site but neither have complete control. Their agreement to lease ultimately means that liability to provide disabled access is shared between landlord and tenant which means cooperation is paramount. The worst thing to do is to pretend nothing will happen and to believe that in times of a lawsuit you can easily pass responsibility onto a third party. When a lawsuit happens the first priority is to always address it. Only after that lawsuit has been resolved between you and the plaintiff can you turn around and sue the third party. Why do nothing just to get involved in two lawsuits only to get an access survey later? Best to get things done right immediately and then move on with your lives than having a cloud of liability bearing down on you. If you are a tenant… then you obviously do not have control over a shared parking lot or areas which would require major rennovation. The best thing to do is to get an access survey. You then take that information and send it to your landlord in a registered letter. We can help you do this. Unless a contract expressly states that a specific party is responsible for compliance with the ADA, both tenant and landlord remain liable. Landlords always remain liable because 1) a tenant making any changes to a property will always be limited as to what they can accomplish without a landlord’s permission and 2) unless expressly stated, a tenant is often only responsible for returning the property back to the landlord in a similiar or equal condition as it was originally given. Landlords cannot force a tenant to make changes to a property if that property was received in that condition. On the other hand, tenants always remain liable because they must provide equal access to all goods and services. Even if a building is structurally accessible, if a tenant offers a good or service that is not accessible then they remain responsible. Lastly, contracts often do not guarantee that an involved party is safe from another party’s negligence. All parties which stand to gain from a property, or have a chance to comply but do not, remain liable. While the responsibility of each individual is dependent on the time and manner of their relationship to each other and the property, this can actually involve everyone from previous tenants to franchisors, franchisees, landlords, property owners, ADA experts, tenants, contractors, architects or design professionals, real estate agents and sellers, to name a few. Given the complexity and possible financial burdens involved with being responsible for ADA compliance, EVERYONE would benefit from the earliest possible resolution to any issues with a site’s access. On the one hand, is this good news; a tenant or landlord is not alone in carrying the full responsibility of defending a lawsuit. But on the other, this is bad news as any negligence anywhere down the line leaves everyone else exposed. The ADA has been law since 1990. These are not new laws. Like disclosing that a property needs a termite check, or that a property requires major reconstruction, to refuse to disclose or to repair that a property is not ADA-compliant remains the liability of those who pass their responsibilities on to others. If you are a contractor or an architect and see something that is affect by your scope of work — but only do what you are hired to do, you can still be responsible. A client who hires you for construction expects your work to be done without any problems. If you are a Real Estate Broker and you don’t tell your clients or your buyers that something is amiss, you can still be responsible. A prospective leasee would expect to get a fully compliant site when they move in. Likewise, a prospective buy would want to know what kind of future work a site would need. If a party takes action to create or approve of conditions which are illegal, that party is both negligent and liable. Ignorance will not be a defensible protection. If a future plaintiff were to sue, they would definitely name the business, not caring or knowing who did the work to put that incompliant issue there. Try talking a cop out of giving a speeding ticket, or claim to a judge that you didn’t know the minimum wage was a particular dollar amount… see if they let you off the hook then! The ADA is human rights legislation. Violations of the ADA count as acts of discrimination. Hence there is no ‘grandfather clause’ in the ADA as one cannot ‘grandfather’ discrimination. Furthermore, the ADA passed into law in 1990. Even though the ADA states that access must be made when a major renovation is performed, the ADA also states that access must be made when it is ‘readily achievable’. More than 15 years has passed since the ADA has become reality so that establishments have had more than enough time to adjust. Recently, for example, A Dallas busline was sued by the Department of Justice. This is a fine example of how the ADA isn’t building code. Buses aren’t buildings! Nonetheless, they are required to provide equitable access — this also applies — of course, to buildings and businesses. Another good example of how the ADA is not building code applies to service animals. When is a service animal not a service animal? Try asking a general contractor or an architect about this common ADA question. It’s possible they can do some research on this issue and come back with an answer. The law is actually contradictory on this point, so if they don’t read all of the text, they could end up telling you to do something illegal. Don’t get slapped with a lawsuit! Don’t think you can do thing yourself. Access surveys need to be complete. Fixing a few simple items is always good, but doing the more complex issues could get you in trouble. Nonetheless, don’t take our word for it. This page has links to FREE ADA INFORMATION directly from the governing bodies. The ADA with the ADAAG (Americans with Disabilities Accessibility Guidelines) are a very detailed and extensive document. Combine this with the California Building Code and you have yourself thousands of details which must be examined and looked at. You can spend several months looking into all facets of how accessibility applies to your facility but why waste time on all this detail when you can hire an expert who already knows what to do and has the experience to do it? While there are many hundreds of differences and conflicts between the California Building Code and the ADA, we have complied a few for you to look at. Not knowing a few ADA and CBC conflicts can actually make your site more liable. If you comply with one but not the other, then you run the risk of a lawsuit. Drive-by litigators often sue many businesses in an area simultaneously. Any single violation of the ADA or California Title 24 can trigger a minimum of $4,000.00, per occurrence. You can find the mention of the dollar amount for discrimination in black and white in the California Civil Code Section 52. This quickly adds up to a large sum of money after multiple occurrences of discrimination. You can find the definition of discrimination relating to the ADA in California Civil Code Section 51. Litigators use these enormous amounts of money as leverage to extort cash settlements from small business owners that can’t afford a long and expensive court battle. Settling often seems like the easiest thing to do, but when you settle once, you can set yourself up as a future ADA target. Drive-by litigators have been known to hit the same place again and again with different complaints each time. A professional inspection will help you address ALL of the common complaints raised by litigators, as well as show you other possible liabilities that you may never have been aware of, or was not brought up by the litigator the first time. Because the ADA and California Title 24 (Chapters 10 and 11 — California’s version of the ADA) have different and sometimes conflicting laws, compliance can be very confusing if you don’t have all of the information. Business owners often try to fix things by themselves according to ADA guidelines. However, these are often in conflict with California’s guidelines and the International Code Council’s ANSI standards as well. If you can’t get these issues resolved, it can take much longer to get your accessibility work to be approved. Click here for a lengthier explanation of how to balance ADA Compliance with Fiscal Responsibility. Otherwise, the text below is a general statement. Access is required to be made when ‘readily achievable’. Remember the potentially large number of individuals and companies who could be liable? The ADA requires that liable defendants produce their financial statements in a court of law to decide what kind, if any, access is ‘readily achievable’. Given the amount of equity the commercial real estate industry has invested (as well as the large number of individuals involved), arguing that access is not ‘readily achievable’ can become an expensive legal undertaking. Accessibility is here to stay. The laws have been around since 1990 and the population of citizens with disabilities, including injured veterans and the elderly, is rapidly growing. Changes are continually being made by courts and by legislators. As the laws become older, courts are going to be less sympathetic to those who ignore them. The longer anyone waits, the more likely that a lawsuit will come about. The cost of an ADA inspection and some simple contract work will always be cheaper and less stressful than hiring lawyers and suffering through a year-long lawsuit. Settling may make a lawsuit go away but it won’t fix the liability. Since the ADA allows businesses to be sued more than once for the same thing, in the long run, not being in compliance is actually much more expensive than being in compliance. Finally, the costs of accessibility compliance can be shared between tenants, landlords, and even the IRS (click here for more information). How you approach the issue of ADA compliance depends on what party you are. If you are a landlord, you may want to make expressly clear that the burden of ADA compliance lies with your tenant in a contract. If you are a tenant, you may want to get an ADA survey and forward the information to your landlord. If you are selling a property, you would want to disclose the condition of ADA compliance to your prospective buyer. If you are a buyer you would want to have an ADA inspection done of your prospective site. Ultimately, the best thing for your customers and for your liability is to become completely compliant with the ADA. In each case, we are the best thing for you. We can help you avoid getting into lawsuits. If you are sued, while there is no substitute for good legal representation, we can still help you and your lawyer throw out all the claims which do not apply. No matter what you do, it is always wise to hire an ADA expert to inspect your site’s accessibility. Assessing and maintaining the accessibility of a site while keeping up to date with changing ADA laws can be a difficult undertaking. If you wish to take the time to perform your own research, the Department of Justice has made the ADA Accessibility Guidelines publicly available. Unforunately this checklist is is OUTDATED. In order to be compliant you’ll have to combine that checklist link above with this updates guide, also from the Federal Government. Now that covers the Federal Government. California has a separate set of standards, which are changing constantly. You’ll also have to negotiate any conflicts between federal and state guidelines, as well as building codes, which open you up to even more liability! If you would like a fuller set of links to official sites for ADA Compliance, we have it here. If you want our expert to come to your site to look at it and help you comply, you can find that information here as well. Don’t let yourself be blissfully unaware of the ADA and then being blindsided by a lawsuit. Lawsuits and settlements are expensive. Much more so than getting an ADA inspection or becoming compliant with the ADA. If you are a small business, most of that can be used as a 50% tax credit! If you get sued, no one will help you. Of course, if you have good relations with someone, and they are in the industry, you should ask them. Additionally, you should ask your attorney about ADA compliance as well. What people don’t understand is that Title III of the ADA contains as much legalese as it does building code. So asking your attorney to do an ADA inspection is a possibility too. We’ve met attorneys who have done ADA surveys. They generally didn’t do a very good job, never having done an inspection before (it takes about 3 months of solid day to day inspections for the average person to get proficient at spotting ADA compliance issues, but that doesn’t mean such an individual can make ADA recommendations either…). So the recommendations they did don’t really help their clients escape liability in the long run, as they said things which were incorrect. But if you’re an attorney who was unable to find an ADA expert (and there are those still, although 2 years ago that was quite common) what else can you do? The same logic works for architects or contractors. The vast majority of them aren’t attorneys either. They might know a few things about accessibility, but generally speaking, they also don’t know what they don’t know. Incidentally, understanding that you don’t know what you don’t know is a quality, an asset, of an expert. Having said that, I think it’s important to add that we are not contractors nor are we architects. We can tell you if something is ADA compliant as a finished product but we can’t pour your ramp for you (so please don’t ask us to). Nor can we produce design drawings and blue prints. We aren’t drafts people either. But that’s why we work with such professionals. They know what they know, and we know what we know. So yes, Architects and contractors BOTH DO know building code (or so we hope — there is a ton for them to know). Both groups should know construction standards, how to go through plans check and something about doing a cost estimation. But do they understand the area of the ADA which covers all the legal definitions? Do they keep you with the changing nature of ADA compliance? Most architects I meet all say enthusiastically, yes yes, I know ADA, I’m an architect. Yes that’s nice you’re an architect, but architecture covers a huge area. Most architects design residential housing. Not commercial property. Those who have worked in the commercial industry probably know some common details. But knowing something about a field doesn’t mean they are an expert. Do you think that any given architect will claim to be an expert at structural engineering? Or conveyor belts? Or elevators? Or all the mechanics in commercial kitchens? Are architects also sound and audio engineers? These areas all are mentioned in the building code. Likewise, the ADA is Federal Law which covers a large group of legalese. Are architects experts at Federal (and State) Civil Rights Law as well? The same thing happens with contractors. Many contractors are quite proud. They should be, they have helped build the country. But some will get red in the face and become quite defensive. If they are a general contractor, it’s because they know a little bit about each area — they have to, otherwise their subs could take advantage of them. Like architects, general contractors must know a great deal to function as a general contractor. But it’s really doubtful contractors are as an expert as some of their best subs. Can a general contractor put a brick wall up as well as his subs? Can he wire a facility as well as his electrical guys? Can he pour and mix concrete as well as his concrete guys? What about installing an Heating-Ventilation-Air-Conditioning Unit? Or working a crane? Maybe, but probably not. The same issue with contractors also follows with architects as well. They know what they know, and we know what we know. Do they have the right, specialized tools? How do they measure door pressure? What about floor-slippage? What is the ADA standard for floor slippage vs the OSHA floor standard? Which one is correct? When are truncated domes required and when are they not required? How is Section 8 Housing effected by the ADA? What is a disability as defined by the ADA? Where does the ADA conflict with the CBC? Did you know that Amazon’s Kindle violates the ADA? Most of you are probably rolling your eyes, but look, it falls under the same ADA laws that affect your business. The ADA isn’t building code! Now ask yourself: Can an architect or a contractor help you on the basis of them being an architect or a contractor? No! They can’t! Anyone who does ADA consulting for you also needs to have ADA expertise as well. Why this is a mystery is simple. Most professionals in the industry are just unaware of the complexity of Civil Law, State and Federal that Disability Access Compliance entails. One of the biggest issues with treating the ADA as building code is that the principles behind the ADA are missed (because it’s not explicitly stated). Compliance with the ADA is not piece-meal. With a building you can upgrade a room, or change a wall unit. But the ADA requires a continual path of travel from the public right of way to the deepest core of the building (probably the restroom). The main principle behind the ADA is that all goods and services offered to the public must be equitably accessible to all individuals, including those with disabilities. This effects EVERY BUSINESS, not just ones with a physical location. This means that anyone doing an access inspection must be educated on access standards, on the experience of someone who is disabled. They must be able to go through a site and find the issues and liabilities that effect those with disabilities and yet be aware of what the law says needs to be present. This kind of education goes beyond simply being disabled. Ask your disabled nephew Eric, who is in a wheelchair. He can tell you tons of stories about what he goes through when he leaves the house but he doesn’t necessarily understand the challenges of someone who is legally blind or deaf… In fact he probably doesn’t appreciate truncated domes a requirement to help those who are legally blind. Those truncated domes can damage his wheelchair and hurt his arms and wrists as he rolls over them. Nonetheless truncated domes are required by several government entities and the public right of way. So if being disabled doesn’t qualify you as an ADA expert what does? So that’s why you can’t ask architects or contractors do to a complete ADA compliance study. They can help (and they should be involved) just like attorneys should be involved. This is why you need an ADA expert. We put everything together for you. I know that at this point, many of you will have questions, comments and your own personal story. That’s fine, that’s part of what help@accessolutionllc.com is for. If you want to talk to me, my number is (866) 982-3212 x 2. If I don’t pick up, please leave me a message. I will call you back. Go ahead. Ask away! I want to hear from you. You could. But that isn’t the attorney’s job, per se. Attorneys didn’t get trained to work with a tape measure or a slope meter in law school. Attorneys do know the process of law. That’s what they do. We don’t know the process of law, at least not like an attorney does. In fact, we are not attorneys. We are not a legal firm. Nor do we employ or retain attorneys for services provided, nor do we have attorneys who provide legal services. All information provided is for information purposes only. YTA is a non-legal consulting service and the Customer is urged to seek advice from an attorney for any current or future legal matter. Having said that, it’s fairly easy for an attorney to understand whether they can do an inspection or not. The ADA is littered with building code issues. They may not even know how to measure a parking space (do they do it from the inside of the blue line, or do they include the blue line?) — or why they are measuring something. Why 72 inches? Why 60 inches? You could ask them to do it anyway. An attorney can study the ADA and CBC and go ahead and then drive out to the site with all his notes, buy the proper tools and so on. The CBC on ADA compliance is 2 chapters, but would the attorney even know where to go to buy it? The PDF for the new ADA is over 4 MB of text and design drawings. For an attorney to study all those drawings and reconcile both sets of data, that’s a great number of billable hours. This would be on top of the legal research and building department research they should do for an ADA compliance project. Needless to say, we won’t charge nearly as much. Plus we already have the tools and the knowledge. That’s pretty much a no-brainer. Let attorneys do for you what they do best. Let us do for you what we do best. This question is actually a trick question because the truth is an ADA inspection by itself generally does nothing for your site. And yes, we are in the business of providing inspections, among other knowledge related ADA Compliance products. I am being truthful. If you get an inspection and DO ABSOLUTE NOTHING with it, you will be throwing your money away. In fact, if you get an inspection and think that this is somehow your insurance, then we don’t want your business. Because then you’re probably the type of person who will say that it was actually our fault. Or, you don’t really understand what the ADA is all about. You must understand that ADA inspections need to include both the California Building Code and the Americans with Disabilities Act. Both tend to change over time. So if you got an inspection in mid 2010 (when the 1990 ADA and the 2007 California Building Code (CBC) were in effect) and didn’t do anything until mid 2011, then your report is already out dated as it doesn’t take into account the updated ADA of 2010 and the updated CBC of 2010 (both going into effect in the early part of 2011). The only way to become less liable to a litigious ADA lawsuit is to become 100% compliant, or at least become compliant enough that serial litigants looking for an easy target will pass your site up in favor of other people who think that knowing something makes them more liable. Did you know the average settlement is $4,000? That’s because there’s provisions in the California Civil Code that specify that violations are $4,000 per instance. SB 1608 interprets limits per instance to mean per visit although in the past this had been interpreted as per violation. Per violation had meant that a plaintiff could ask for 120,000, citing 30 violations. If you think 30 violations is a lot, then you should see our reports. Our ADA survey of an average site is THOROUGH. Our report of an average site will come up with somewhere between 50 to 150 violations. For a 3 story office building we’ve had as many as 250 — and that’s doubling some of the more common ones per type. (What I mean is that we are counting missing signage on all 30 doors to be 1 violation). If you know something about ADA violations you’ll understand that this is common. If you don’t know anything about the nature of these violations then you’re probably aghast. So yes… SB 1608 did something good to limit the settlement… at least for businesses that could actually afford to settle for 50k. Large corporations for which 50k or 25k is do-able (like Target or Wal-mart, or LAX) that’s great to limit it at 4k. They can hire a CASp inspector for next to nothing anyway, and bury the disability lawsuit in a bunch of legalese. If you are a small business, you should carefully consider whether or not to get a CASp inspection. But even if you choose not to get a CASp inspection, you should get an ADA survey so you can make the first (and second, and third…) steps to becoming 100% compliant. That is the only way to approach stopping from being sued for ADA violations. There certainly are. We regularly publish newsletters and articles with accessibility tips for all kinds of businesses. These are all under the “Accessibility Tips” category of our articles, and are listed here. Additionally, we’ve also included a page that lists the Official Sites from where all the ADA and Building Code originate so you can perform your own ADA audit. Any other question? Email us at help@accessolutionllc.com or call at (866) 982-3212 x2. If you spend money on getting an ADA survey from us, or on anything spent on just ADA compliance, you can get a tax credit back from Uncle Sam. The alternative (doing nothing and getting sued) means that you must foot the attorney’s fees and/or the settlement yourself. There’s no tax credit for that. 2have less than 30 full-time employees. Currently, the credit is valid for up to $10,250 of money you spend to become ADA-compliant (including our services), and there is no credit for the first $250 of expenditures. Therefore, the maximum tax credit you can receive is $5,000 (50% of $10,000). Just give the tax form to your accountant and he can take care of the rest. This can greatly reduce the cost of restroom and service counter renovations that you may have been planning to do anyways, and makes our inspection practically free! If this amount seems a little odd to you, you’re probably right. This is because (unlike most tax credits and deductions) the Disabled Access Tax Credit has not been updated since the 1990s when it was first introduced! If you would like to see the IRS provide more help for businesses like yours to comply with the ADA, you should contact your State’s Senators and Representatives. CASp stands for Certified Access Specialist program. It’s a voluntary program put in place by Senate Bill 1608. The basic idea behind CASp is to not penalize those who are trying to comply with access. If you are a business and you do absolutely NOTHING you get NO protection at all. The explanation below is the short version. There are two statuses for a site, CASp-determination-pending and CASp-certified. As of yet there is no site (that I know of) which is CASp-certified. To be certified means you are 100% compliant. Pending just means you are in the process of becoming 100% compliant. The first step is go get a CASp inspector to come to your site and look at everything. From there, they will provide you recommendations and a report. You try to comply, you get a certain amount of time, based on what the inspector says. During this time you are CASp-determination-pending. So the point is that while you are CASp-determination-pending you have an ADA transition plan, which has priorities and steps. Eventually, within a reasonable time, based on your entity’s finances, you become CASp-certified. You can do this without CASp. But what CASp provides as a legal incentive is a 90 day stay if you are sued. This also means you can go directly to arbitration — you don’t have to go through the expensive legal fees that are related with the normal process of law. A 90 day stay will also stop the lawsuit, which means that’s 90 days where attorneys’ fees do not meter. There are several considerations for CASp which are important to note. CASp will not protect you from a lawsuit. It’s the unfortunate truth that NOTHING will protect you from a lawsuit. Even if you are 100% compliant, anyone can sue you at any time. That’s just the kind of litigious society that we live in. CASp does offer you the 90 day stay, and arbitration which is an expedited way of avoiding some of the costs of a lawsuit. CASp carries with it several legal responsibilities. The first is that after getting an inspection, the status of your site is a matter of public record (you might want to ask an experienced ADA attorney about what your options are). Being a matter of record means that you MUST comply with the ADA plan. If you sit and wait on even simple things, and you do get sued, then you will look VERY VERY bad in court. If you wonder if an inspection will make you more liable, then go here. But the basic blunt of it is that you must comply with the report and make your way to becoming 100% compliant. These responsibilities also weigh on the CASp official. Such an official carries an added liability for what they do and say. As such, their license can be threatened. Already, CASp is quite expensive to obtain. So as you can imagine, the cost of CASp along with the liability make CASp inspections quite expensive. Adding all these together, a business that decides to become CASp certified will carry much of the monetary weight. Really, the general consensus is that SB 1608 was pushed forward by the California Chamber of Commerce to protect larger businesses. Businesses that can afford a CASp official or a pet consultant can then bury their access issues under a mound of paper work in order to avoid more expensive lawsuits. CASp and SB1608 does not protect against lawsuits. All the same, in general, some good things did come out of SB 1608 for businesses, but the net the effect is that it does not protect businesses from lawsuits. CASp is still an important option for businesses to carefully consider on the way to becoming 100% complaint. The 90 day stay offers significant protection against legal fees. 100% ADA Compliance is the BEST way to avoid a lawsuit. How can I keep from getting sued? The fact is, we live in a litigious society. ANYONE CAN SUE ANYONE. People in general do not sue anyone — that’s a lot of work. But the option is always there. Changes are, your site is not-compliant. I clearly have never been to your place of business, and I have not seen any of the work you’ve had done. But I can tell because 97% of all places, including new ones, are not compliant. The reasons are complex, but the short of it is that you wouldn’t be reading all of this if you were not sure. 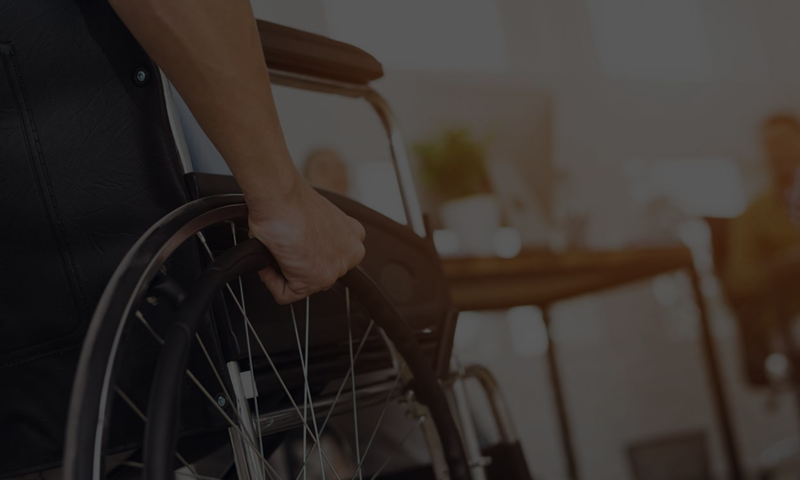 Nonetheless your customers, friends and family of your employees, clients, delivery people — anyone who is or could be disabled — has been to your place and was probably inconvenienced. But they didn’t sue. They might have even mentioned to you or one of your employees. But they wouldn’t sue. It’s a bit of work for them to do that, and most of them would feel bad for suing, even if your site configuration was frustrating. The majority of people who sue for disability non-compliance are serial litigants. I am referring to people who would sue for the high fines involved. Such individuals generally sue for relatively “minor” infractions, because those are readily achievable. Basically this means that if someone is easy to fix and you don’t fix, then in court, you look negligent and discriminatory as defined by the California Civil Code. The general tactic (and we’ve seen enough) is that these professional plaintiffs look for easy violations, sue a large number of stores, asking for huge settlements. Then, as a business decision, the business will probably settle in order to avoid paying the lawsuit. Unfortunate, but settling is cheaper than a lawsuit. So how can you keep this from happening to you? Become as compliant as possible. There’s no magic document, no magic trick. Anyone can sue. Suing is a civil right. But to avoid those who are looking for an easy target, you must remove all the red flags that your site has. How do you know what those red flags are? Become ADA educated by reading this blog through the links on the upper right. We also offer seminars now and then, in and around the Los Angeles Area. In order to maximize benefit to the public, we try to do this through business organizations who understand the need for ADA compliance— because they have established networks that will help spread the word. We never charge the organization for our seminar but they may charge you, however, to cover their costs. If in the course of either an ADA inspection or after coming back to our seminar you discover that there is no possible way for your site to become 100% compliant — maybe there is a structural issue, a technical infeasibility or maybe your landlord doesn’t care or is unresponsive. Baring becoming 100% compliant at your current site, the next best thing to do is to move to another place that is 100% compliant. How can you assure yourself your new site is compliant? Don’t fall into the traps these local businesses did of being blissfully unaware of the ADA and being blindsided. Get an ADA survey. Hey, that could help you negotiate down the price of moving in.